The oldest and most traveled space Shuttle Discovery, glided back to Earth on Wednesday after its final space flight before ending its days as a museum piece to delight the crowds. 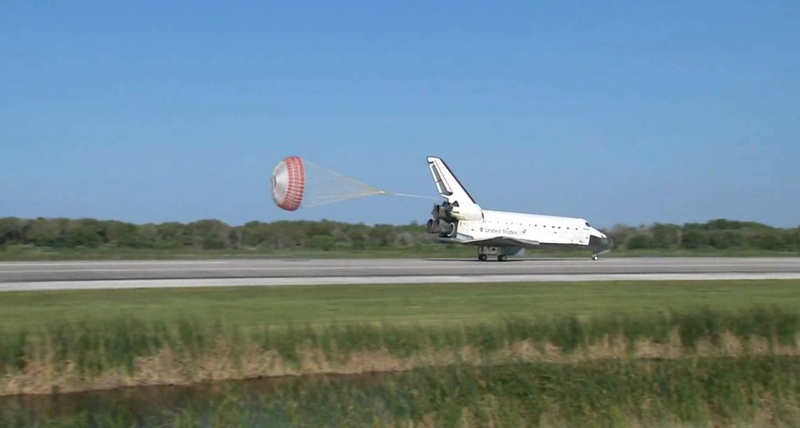 NASA’s oldest shuttle touched down on a mostly clear day at noon at its home base in Cape Canaveral,Fla. “To the ship that has led the way time and time again, we say, ‘Farewell Discovery,'” radioed the Mission Control commentator. The aging space shuttle has flown more than any other in the fleet during its 27-year career, and NASA heaped praise on its swan song, toting a crew of six American astronauts on a 13-day mission to the orbiting research lab. “The entire space shuttle system just performed outstanding on this entire mission,” the chair of NASA’s mission management team Leroy Cain told reporters on Tuesday. “We have had an awesome display here of the capabilities of the team and the hardware.” Discovery’s mission was initially scheduled to last 11 days but was extended to 13 so that astronauts could work on repairs and install a spare room to add 21 by 15 feet (6.5 by 4.5 meters) of extra room for storage and experiments. Astronauts also brought the first humanoid robot to the International Space Station (ISS), though it spent most of its time wrapped in packing materials and will not become fully operational for some time. The shuttle spent a total of 365 days in space, logging almost 149 million miles (241 million kilometers). NASA postponed plans to roll out the shuttle Endeavour to launch pad 39A on Wednesday evening, shortly after Discovery’s landing, saying the delay would be “at least 24 hours due to predictions of unfavorable weather.” Endeavour is to be commanded by astronaut Mark Kelly, whose lawmaker wife Gabrielle Giffords is recovering from a bullet to the head, after a gunman went on a deadly rampage at a political meeting she was holding at a grocery store. Kelly has said his wife is undergoing a grueling schedule of rehabilitation exercises and he hopes she will be well enough to attend the launch April 19 at Kennedy Space Center. The shuttle Atlantis is scheduled for its final flight on June 28, which would mark the last shuttle mission ever.After that, the sole method of transport to and from the ISS will be via Russia’s Soyuz space capsules, which can carry three people at a time. Discovery has broken new ground multiple times since it first launched in 1984. It transported the Hubble Space telescope, was the first shuttle to be commanded by a female astronaut and the first to rendezvous with the Russian Mir Space Station. The shuttle was also the first to return to space after two major disasters, the Challenger explosion in 1986 and the Columbia disaster in 2003 when the shuttle broke up on its return toward Earth. One shuttle is already in a museum outside the Washington, D.C.. Enterprise never flew in space but was developed as a prototype for the other five shuttles in the original fleet.